With the decorations complete I reinstalled all of my cabling and peripherals and added a single RED LED light behind the monitor. This gave it the perfect slight glow and wasn’t distracting or overwhelming. Since the Air 240 has not optical bay I also added an ASUS external DVD burner and an additional USB 3.0 hub. I decided to hide this under the right cabinet door leaving enough room for disks and USB drives. 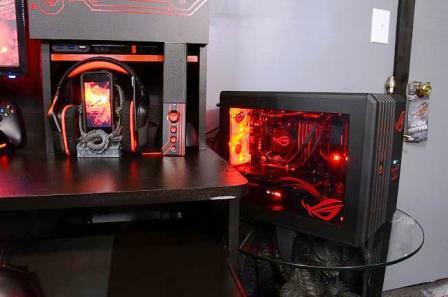 This also marked the completion of the ROG Battle Station. With the planning and hard work on the ROG Battle Station the finished results were well worth the $200 total for supplies. The ROG Battle Station and my passion have led me all the way to Taiwan, Computex, ASUS Headquarters and great friendships. The memories of everyone and being a part of something bigger will always be with me and never forgotten. Sometimes it pays to be a Loyal Fan … Join the Republic, Game on!